I recently bought some yarn for the kiddos to make blankets. Well, technically, two blankets and a cape. I started on the cape today, as it would prove the most thought provoking. It will have to be my own design, as I have not found a pattern for an Ice Princess Cape from a famous animated film. 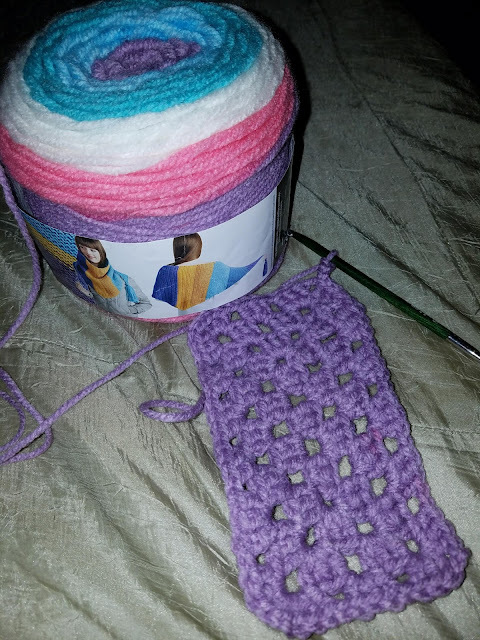 The color is Snow Queen, aptly named, and I started with a granny rectangle. In this one, I chained 13, then did 3 dc in the 4th ch from the hook, and...well, I will write it down when I finish it and probably put it on Ravelry. One of my goals/directions this year is to finish the Master Crocheter's course. I have had it for a year, and have barely made progress on it. Other things have taken up my time. I want to spend more time crafting for myself, and that is one big otem I would like to accomplish.